With Valentin's Day less than a week away - I've used this opportunity to make one last Valentine's Card. This time I've made a square card measuring 5.5". And as much as I try to avoid it, I got out the sewing machine. This is my first use of the new Candied Apple Distress Ink and I simply love the color. It is a true red and so perfect for this project. The top square of the card was cut 5" square and then covered completely with Candied Apple Distress Ink using a blending tool. Next came the spritz & flick. I added a little Perfect Pearls in the water to add a little bit of simmer to the surface. After waiting for the ink and spritz to dry completely, I'm not good at waiting, I stamped the heart from Tim's Valentine Blueprint Set using VersaMark Ink. Next I added black embossing powder and then heated. After tearing all the edges, Hickory Smoke Distress Ink was used to edge all around the front side as well as the back - you will see why ink was added to the back later. 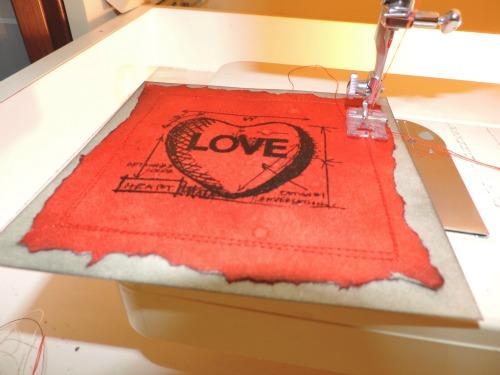 The top 2 pieces were sewn together using red thread. The torn edges were then curled up slightly - the back side shows just a little by doing this - that's why the back side of the first panel was inked. 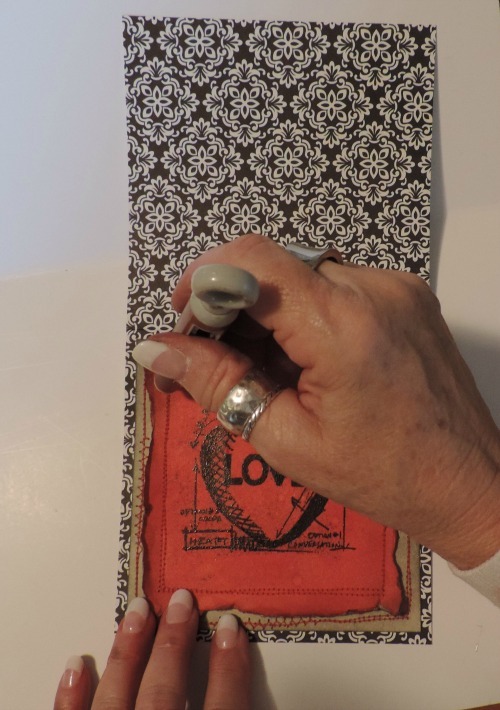 Then sewing once again - add the top layers to the card base. A black and white cardstock was used for the base. Two holes were poked in the top of the card to run the twine through, then tying a small bow. An arrow from Tim's idea-o-logy line was used along with some craft wire to decorate the bottom of the card. I hope you have enjoyed the first stop on our journey and that you will want to try a project using the travel bag contents. Be sure to come back each Monday to see what the other Creative Guides have in store for you. It should be great fun seeing what comes out of the bag next. 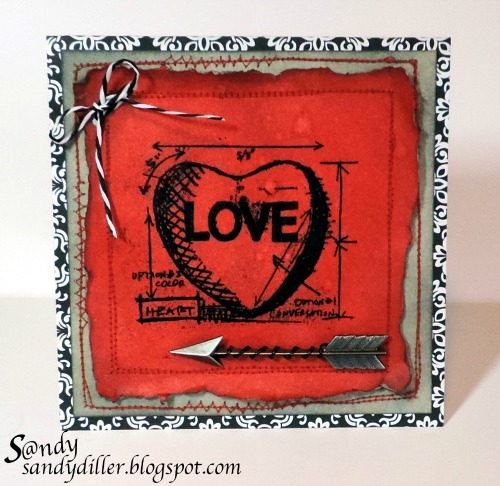 Fabulous card Sandy and a great step by step!! The red stitching really adds to the overall effect! Oh and love the nails lol! Like the Valentine. Esopecially like the candied apple color. The stitching goes well with this. My hubby gave me a Brother sewing machine last yr and it threads itself. I sew dog collar scrunchies for my dog Daisy & have stitched a card but need to give it another try. Have a BEE-utiful day! Bold and beautiful - love the stitching. Interesting concept and overall design indeed, warm greetings to you! Beautiful bright Valentine love it!